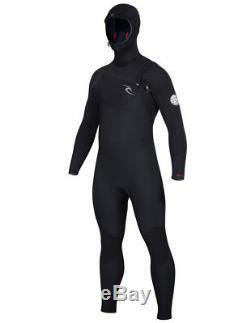 Rip Curl Dawn Patrol 5/4mm Chest Zip Hooded Wetsuit. 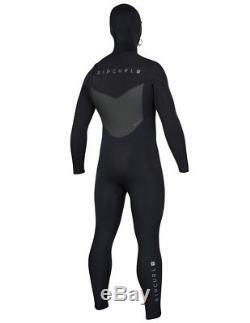 Men's Rip Curl Cold Water Surfing Wetsuit. The new Dawn Patrol chest zip redefines performance and value from a leading Wetsuit brand. Flexibility and warmth are unparrelled a this pricepoint. All new Thermoflex superstretch neoprene lines the internal torso and legs for increased stretch and warmth. We added E5 to the arms and 3/4 internal E5 tape to the rest of the body. Subtle refined graphics and colorways add a level of superiority. E5 Neoprene - Rip Curl's premium high stretch neoprene. Super stretch and lightweight with a high quality hand feel that is smooth and comfortable against the skin. The item "Rip Curl Dawn Patrol 5/4mm Chest Zip Hooded Wetsuit Men's Large Tall, Black" is in sale since Sunday, April 22, 2018. This item is in the category "Sporting Goods\Water Sports\Wetsuits & Drysuits\Wetsuits\Men". The seller is "seatoski" and is located in Freeport, Maine. This item can be shipped to United States, Canada, United Kingdom, Denmark, Romania, Slovakia, Bulgaria, Czech republic, Finland, Hungary, Latvia, Lithuania, Malta, Estonia, Australia, Greece, Portugal, Cyprus, Slovenia, Japan, China, Sweden, South Korea, Indonesia, Taiwan, South africa, Thailand, Belgium, France, Hong Kong, Ireland, Netherlands, Poland, Spain, Italy, Germany, Austria, Israel, Mexico, New Zealand, Philippines, Singapore, Switzerland, Norway, Saudi arabia, Ukraine, United arab emirates, Qatar, Kuwait, Bahrain, Croatia, Malaysia, Brazil, Chile, Colombia, Costa rica, Panama, Trinidad and tobago, Guatemala, Honduras, Jamaica.